Shareware was the new big thing in game developing. It was the next step in playable demos released in magazine disks and tapes, but now the game demo would mostly be spread by word, friends, notice boards - mostly by copying and spreading out like pirates normally do, but without the illegal bit, since it wasn't a commercial release. Nor was it really a full game, as it would normally only feature a few levels or an episode of the full game, but it would still usually feature full playing features. By paying a required sum through snailmail or whatever method was available, you would then get the full game straight from the programmer. This was the preferred method of selling new software in the early 1990's, most particularly on the PC, but the same idea was very much used in the Amiga and Atari communities as well. Although our second part started with an introduction to the shareware idea, our first game from the indie scene was apparently released as freeware, because I have never found any info of it being either a commercial or a shareware release, and the only version I've found of it is just as full a game as I could imagine it to be. It was programmed and released in 1990 by a man called Jani Metsätähti, and amongst other things, inspired a friend of mine to name her jazzfusion band by one of the characters in this game. The game is called Deluxe MopoSota (translated as Deluxe Mopedwars), and it's a very evolved version of the Tron lightbikes game, with the ability to use guns and custom arenas. It also has a nice list of humorously altered familiar characters you can play as, three weapon slots in each bike, and most importantly for today's players - a numeric speed adjuster. Here's what it looks like. Another indie game developer, Sami Maaranen, had started working on his bigger-than-life project, UnReal World, in the summer of 1990. It was a huge open-world roguelike, taking place in Ankhyrnia, later to be changed into a late Iron Age Finland, where you had to survive in the wilderness, build yourself a cabin and fight against a bunch of... well, you know the drill. But the vastness of the game was something unheard of in a roguelike - more familiar in games like the Ultima series or D&D based RPG's. 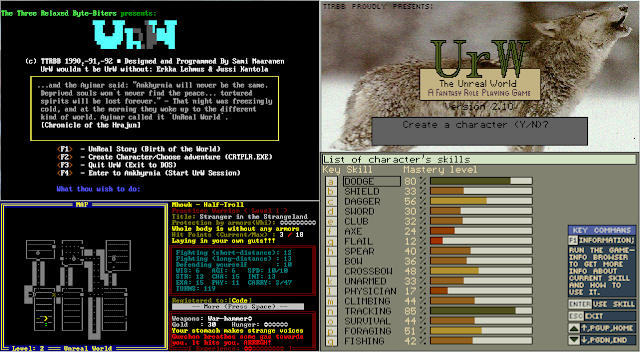 Originally, the game featured ASCII graphics and rudimentary survival mechanics, but the game has been in development for over 22 years now. Here's some comparison screenshots from versions over the years. PC: UnReal World, screenshots from two old versions. really a very huge project and highly recommended to donate if you enjoy this sort of stuff. My favourite Finnish shareware title of all time was released originally in 1993, an overhead racing game called Slicks 'n' Slide. 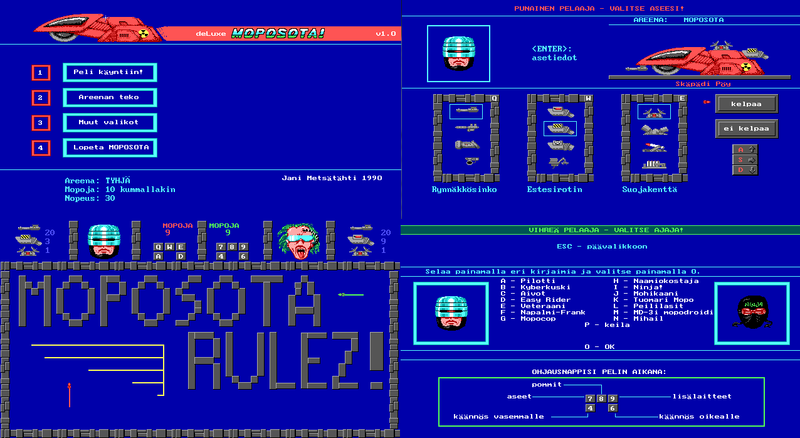 The game was developed by Timo Kauppinen for the DOS, and was the spiritual precursor to another well known racer, GeneRally. The full version of Slicks 'n' Slide would feature a separate track construction kit, which helped the game to age well and slowly, but the fact that four people could play the game on the same keyboard with the right settings, is still mind-bogglingly amazing, and is what makes the game still regarded as one of the best DOS racers of all time. The full version is currently available to buy for 4.95 € at www.digitalfootmark.com. 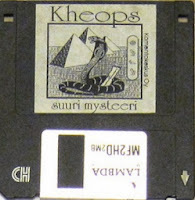 On the commercial side of Finnish game developing industry, in 1992, a well known game store and importing company, Komentokeskus Oy (Osakeyhtiö, which literally means a "stock company", and is the Finnish equivalent of a limited company - Ltd or LLC) released an action/adventure game for the PC called "Kheops - Suuri Mysteeri" (translated Cheops - "The Great Mystery"). I haven't seen it in action, but it is said to have some similarities with games like Dungeon Master, but is more puzzle-adventurish than an RPG. This is the first example of a commercial Finnish release for the DOS that I have come across since Nero 2000, but there could very well be others. The earlier stuff is always less carefully preserved. Then in 1993, two new commercial game companies were established: Bloodhouse and Terramarque. I remember there was a great hype in the Finnish computer and gaming magazines about these two companies, bringing the country some new hope of worldwide success, with so many great scene artists and programmers on board. Bloodhouse's first game was released in 1993, which was basically an evolved version of Asteroids, only with properly updated graphics. 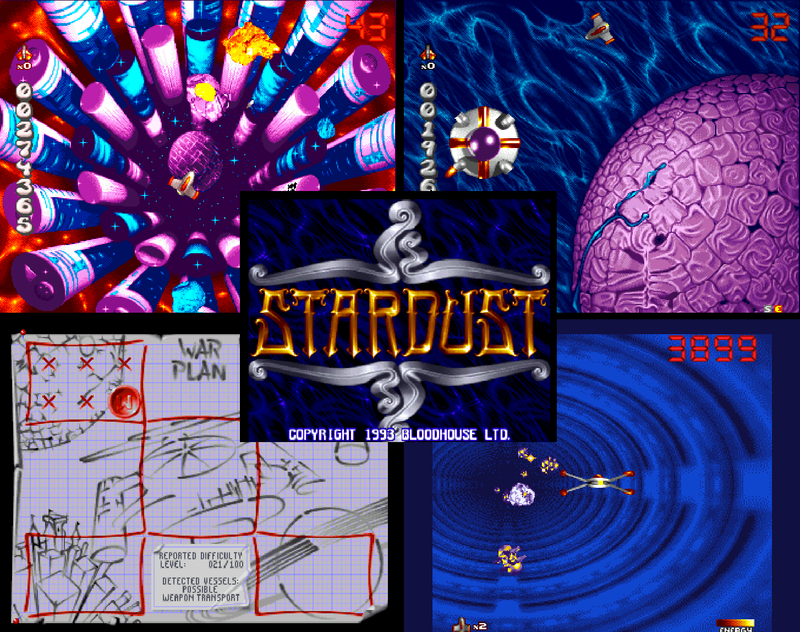 Stardust, released originally for Amiga and Atari ST, gained huge sales within the following year, and was updated for the AGA and CD32 Amigas the next year as Super Stardust. Terramarque's only released game, Elfmania, came out in 1994. It was a competitive beat'em-up and received mostly high scores in Amiga magazines. The game would be the last one to be released, which would feature some involvement from the famous C64 programmer, Stavros Fasoulas, but for some reason, he didn't want to be mentioned in the credits, even though he supervised the entire project and even programmed the A.I. Stavros had worked on a game called Private Investigator Dollarally since 1991, which would've been a cross between APB, Spy Hunter and Grand Theft Auto, but Elfmania took all of his time for a couple of years. 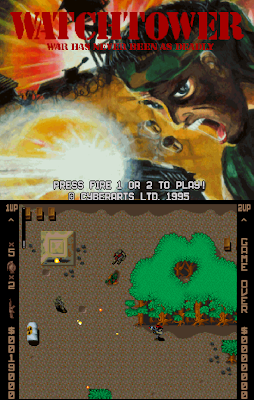 Due to the commercial death of Amiga in 1994, Renegade passed on publishing the game. Only one semi-playable demo of P.I.D. ever existed, but the copy has been destroyed, so we'll probably never see it in action. Hall of Light website has some screenshots preserved from the existing materials available, but unfortunately, that's all there is to it. In 1995, Bloodhouse and Terramarque were joint together as Housemarque, and they concentrated on making commercial games for the PC for the first 4 years, before they started developing for numerous consoles. That's for another time, and likely another blog, but in 1996, GameTek released two of Housemarque's first titles for the PC: a conversion of Super Stardust, and a point-and-click adventure game in two languages: Muukalaisten yö/Alien Incident. It got some hype when it was first released for being the first of its genre produced in this country, but ultimately, was left for relatively small notice afterwards, and it took me some time to dig any version of this one up. 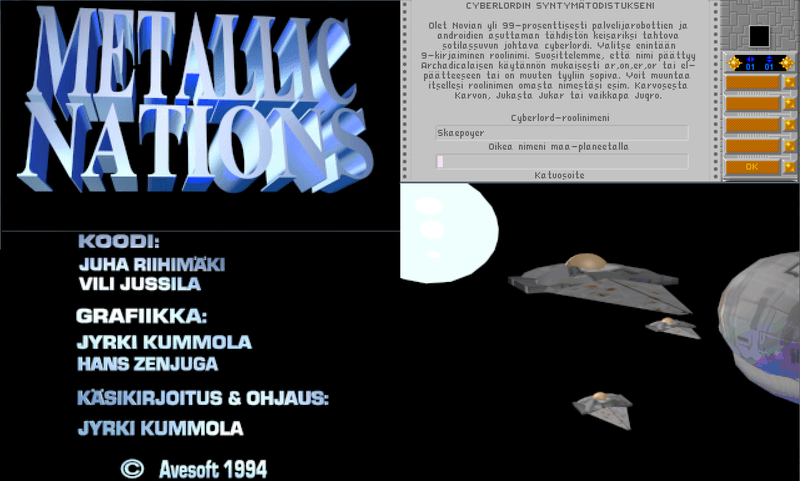 The last currently known commercial Atari ST release from Finland came from a group called Aggression, who released their TurboRaketti clone, Utopos, in early 1995, and is currently available for free download at NT Rautanen's website. Even though the Amiga and ST were dying out, and most commercial publishing houses were shutting down, the Finnish Amiga scene still had something going on in 1994 and even a bit later. For one, a group called Extend Design got their puzzler game Mega Motion released through Black Legend. Then, in 1995, Avesoft released their final product, a unique mail order space RPG called Metallic Nations, which unfortunately is completely unplayable these days due to unsupported netplay specifications, but the idea was, you would buy the game, install it and register as a player to the main server by using your modem. Even more unusual was that you could play PC versus Amiga. This was a really unique thing back then, so understandably it didn't last for long, and as Avesoft ceased to exist, the whole thing fell apart. At least, this is what I've managed to find out about the game - can't tell for sure. But here's some screenshots I could grab from the game. 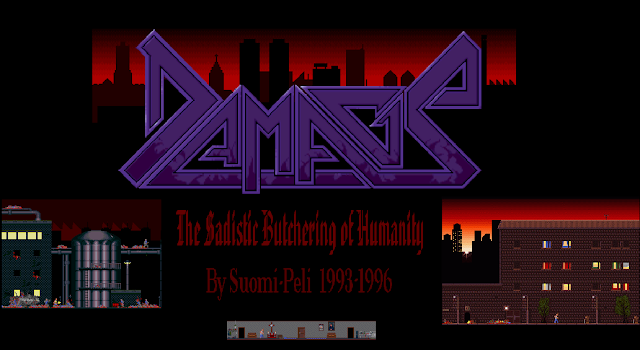 Just before the death blows, a group called Suomi-Peli got a violent beat'em-up game released through Crystal Software. The game was called Damage: The Sadistic Butchering Of Humanity. It used to be rare, but the .adf (Amiga disk file for emulators) is now available for free download at the official Damage website. Finally, OTM released a war-themed Chaos Engine clone called Watchtower from CyberArts Ltd., which was a joint operation with apparently some Swedish programmers, but I can't be sure. It never got much attention due to the commercial death that Amiga was facing (also because of the bad reviews), but it had at least two releases, other of which is rare, and even a CD32 version was planned, but left unreleased. After this, the Amiga was pretty much out of the game, because the commercial developers turned to the Windows PC's, and gradually even to the long dreaded consoles. Meanwhile, still firmly attached to the past, some people were again starting to create games for the good old Commodore 64. Jani Hirvo released a preview of his game Penguin Tower in 1994, but never got around to finishing it. However, a more eager programmer called Tomi Malinen had been coding some basic games since 1989 in the dark, and from what I know, only started releasing his games to the internet in the 90's after the dawn of the emulation era. 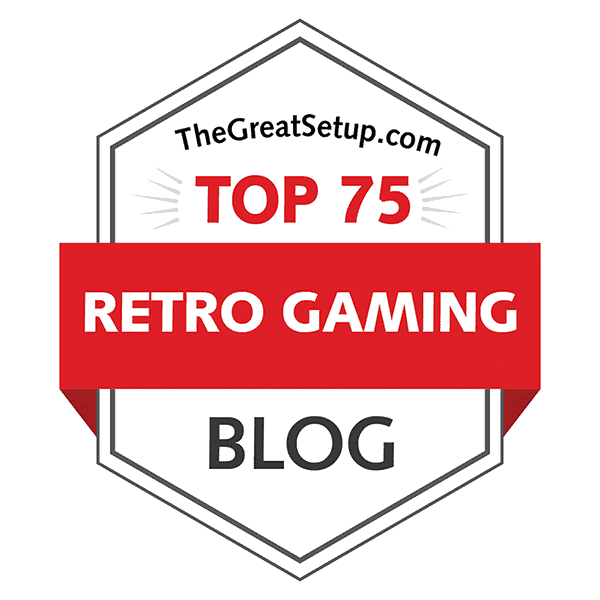 The first known year from his recorded releases after the first Super Lätkä is an collect'em up -type arcade game simply titled Rooms, and currently, the GameBase64 collection has 35 titles credited for Tomi, and he's still creating. Naturally, his programming skills have developed quite a lot in more than 20 years as a C64 programmer, as we shall see more screenshots of his output from more recent years in the final part of this series. Here's a collage of his earlier stuff. Early games by Tomi Malinen for the Commodore 64. Before the commercial section of Finnish gaming industry turned solely to PC development, our hobbyist programmers were still making well-regarded demos and some indie cult hit games. In 1994, one of the longest indie sports game franchises was established with Ski Jump International, or by its proper name, Lartzan SkiJump. With very simplistic graphics and gameplay, the game actually had an immense amount of skill in play, but also a lot of luck. Ski Jump 2 was the one that got me hooked on it, and I still play it occasionally. The later, 3D-modeled Deluxe Ski Jump games started being a bit too high quality for my taste, but they're still great games, and available at www.mediamond.fi. Now, getting back to the earlier mentioned cave flying games genre, popularized for the duration of the 1990's by TurboRaketti II from Amiga, the PC scene really made it massive a few years later. I can't really comment properly on any of this stuff, because I wasn't such a huge fan of this genre, but if you were, any of these names should ring a bell: AUTS, KOPS, Assault Wing, Rocket Chase, V-Wing, KaBoom, and probably most fondly remembered of them all - Wings. Here's some screenshots from a selected few of them. Another big "fashion game" genre in the latter half of 1990's was the worm games. Even before the biggest boom came with Nokia wormgame released originally for the Nokia 5110 phone in 1998, it was very probably Sami "Zorlim" Lehtinen's Pizza Worm from 1994 that started the development again on the age old idea. Pizza Worm was probably the first Nibbles-variant that could turn the worm in any angle at a certain turning speed, in a similar way that you steer a car in games like Rally Speedway or Micro Machines. In the later versions of the game, the worm had a larger array of humorous sound effects ("I'm hungry! ", "Yum! 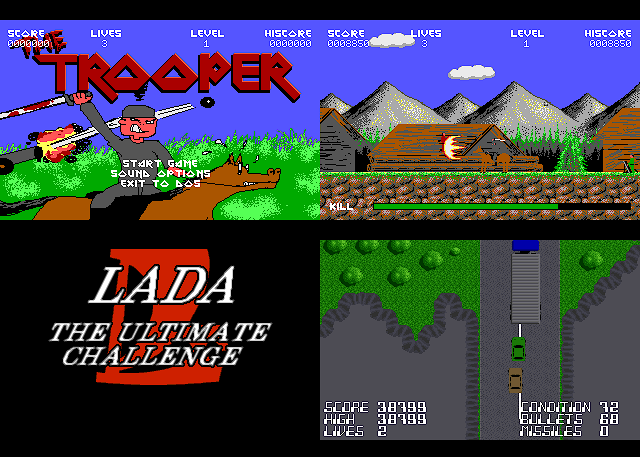 ", "Nom nom" and burrrrp), a funny theme tunes and enhanced graphics. This sparked a few years' period of evolution in worm games. 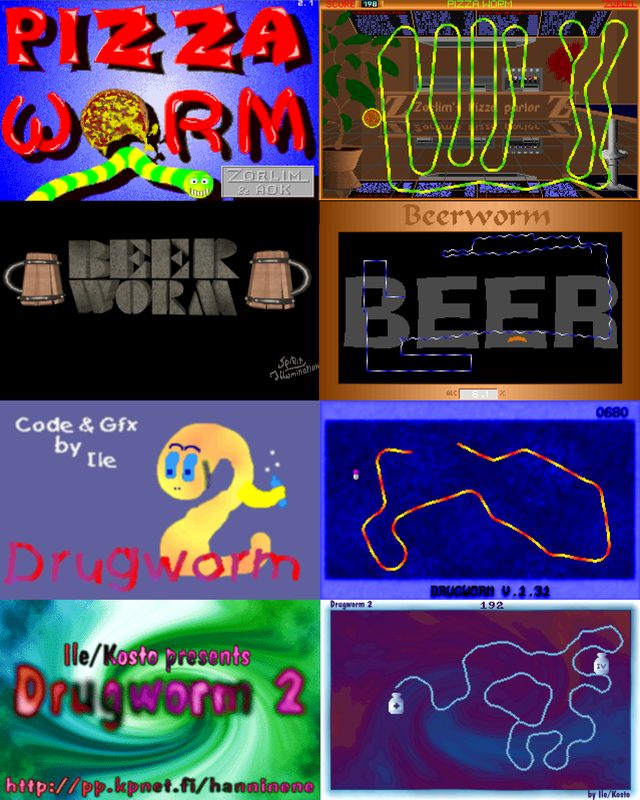 My favourite examples are the ones where consuming the designated items would affect the worm's behaviour, more particularly Beerworm and the two Drugworm games. Zorlim only released one other game, which was a beefed up version of the old Arcade Volleyball game by Rhett Anderson for the C64, Amiga and DOS, the DOS version being the most well-known one of the original. Zorlim's Arcade Volleyball (ZAV) was released in 1995, and was fairly well spread, but the popularity of Zorlim's two games wasn't enough to keep him interested in the game industry, although he still works with computers. A few more favourites of mine need to be mentioned before heading back to the commercial stuff, starting with a fairly provocative mouse-clicking arcade game duo featuring hilariously bad graphics and speech samples of imitated invalids. These two games were called Inva-Taxi (1994) and Separila (1998). I couldn't get Separila to work properly on DOSbox, so here's a couple of screenshots Inva-Taxi. The idea in both of these games is to judge by the invalid person's mumbled speech, where you should be taking them, and then click on the map. In 1996, Tuomas Korppi programmed a rather unique sports game called Hyppyheikkien Sumopaini, officially translated as The Fight of the Sumo-Hoppers, and released it to public domain. It's a really strange game, where you play against another player, both on the same keyboard, trying to use eight buttons to control your sumo's feet by angle and length. It's very hard to explain how to play it, but find it, download it and see for yourselves. It's highly addictive, and very recommended. Also in 1996, a relatively unknown talent by the name of Cadaver released two freeware (or if you prefer, blasphemyware) games called The Trooper (based on the Iron Maiden song), a fast sideways hack'n'slash-type action title, and Lada - The Ultimate Challenge, a fast vertically scrolling futuristic (?!) racing game. Later on, this guy would be doing something entirely unexpected. And finally, we take a look at a group called Skitso Productions. Established in 1995, their first game was released in the same year, and was a vastly evolved variation on the Bomberman idea. Mine Bombers was the title, and became somewhat of a competitor in popularity to Pizza Worm and Slicks 'n' Slide. The game had a single player storymode, and a two-player deathmatch mode, a huge amount of different weapons and other items, and a map editor. An idiot proof hit, then. Their second game was released in 1997, and was a rock festival management game based on an annual festival in Turku called Down By The Laituri. While not as successful, it certainly was a much-needed music themed game at a time when so very little of them existed, and had a very similar feel to it as Rockstar Ate My Hamster. Currently, they're apparently working on a sequel to Mine Bombers, which has been in development hell for the last 15 years or so. We'll finish this time with the birth of one of the most important gaming companies of all time. In 1995, a bunch of demoscene members in Espoo got together and founded Remedy Entertainment. 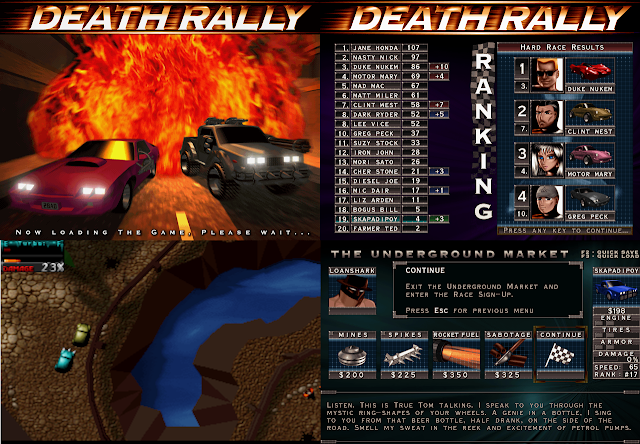 Next year, Remedy released their first game, Death Rally, a top-down perspective racing game with shooting and upgrade purchasing involved. Very much like Gremlin's Super Cars games a few years earlier on the Amiga, but with some good humour, familiar characters and some 3D effects in the mix. It was published by Apogee and distributed by GT Interactive. Later on, Remedy would become the most successful Finnish game developer for a few years with games like the first two Max Payne titles and Alan Wake, eventually also releasing a Death Rally remake due to popular demand. But all that's too recent for my blog to handle. 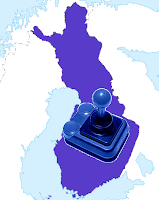 Next time, we'll head towards the inevitable change of the millennium, and see some strange developments in the games factory that is Finland. Thanks for reading, stay tuned for the final part coming up hopefully next month! Part 1 , Part 3 and the Appendix. Curiously, blogger decided to dump your comment into the spam section, probably because you included your blog's address. So, it was deleted when it went into the spam box. =/ Try sending the URL to my e-mail, or post it here with spaces in wrong places or something.